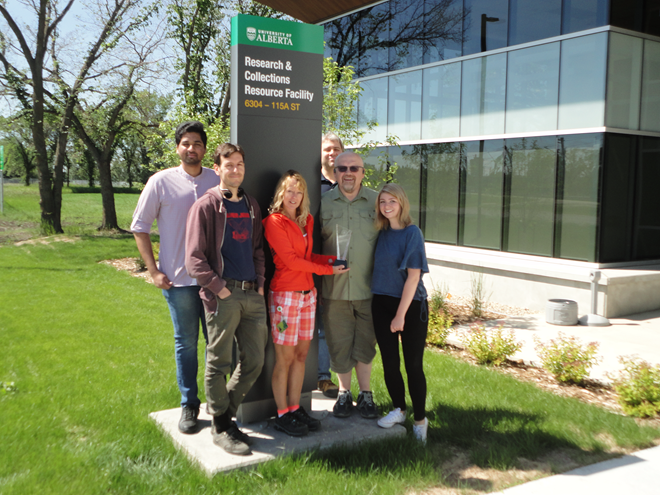 This is a new yearly series on the blog to focus on UAlberta Libraries staff who were nominated for a Service Excellence award. Over the next couple of weeks, we will share the nominees and winners of 2018. Nominees were put forward by fellow staff members and then winners were chosen by an internal committee of peers. The Digital Initiatives Area Leads would like to nominate the Jupiter project implementation team for the exceptional service contributions they made to this complex, lengthy, and challenging project. The Jupiter project (2017-2018) redeveloped ERA and created a new open source application, called Jupiter, that UAL will rely on for future digital projects. For the duration of this project, the Jupiter team has worked diligently and tenaciously to solve what often seemed to be unsolvable problems. Their work to advocate for and establish best practices for user testing, project management and application deployment, high standards of documentation and code quality, and processes to help with team collaboration and communication has reaped some tremendous rewards, not just for the users of ERA, but in improving how we do our work each and every day. Early in the project, the implementation team bravely and articulately voiced concerns about our direction. They also recommended concrete changes we could make in our plans to address the risks and obstacles that they had identified. As a result, we dramatically rethought the way we were carrying out this project. Their insistence on using accessible design, well-written and documented code, good project management principles and team communication practices will reap benefits for our entire team well into the future. Additionally, end users will enjoy greatly improved online services as we continue to develop new applications applying these principles. Through close collaboration with each other and extensive experimentation, research and creative problem-solving, the members of the Jupiter team have developed a number of exciting innovations which will benefit both internal and external UAL users in many ways. For example, the dev and sys admin groups worked together to create a new environment for testing and demonstrating work-in-progress that lets us more quickly test features with end users, and check that everything is working as expected. They also implemented automated processes that greatly reduce the amount of time people in ITS and DI have to spend manually testing and monitoring different parts of the code. Team members from the metadata group drove the creation of a migration process that makes innovative use of tools to make our metadata more consistent and easier to access for testing. They worked closely with other teams to establish shared documentation to help prevent issues we had experienced in past projects when shared data was inconsistent. These improvements have been widely adopted by other projects in DI and will be used and improved on into the future. The entire team has been deeply committed to the principles of this project from its inception, and their leadership in finding better ways for us to do our work has inspired and invigorated our ongoing work. They have been advocates for better and more accessible design, sustainability in our practices, and are always seeking to improve in how we communicate, collaborate and do our day to day work. Mariana Paredes-Olea, Zach Schoenberger, Natasha Nunn. Why is the Public Service Team at HSS so awesome? Because of the team’s amazing ability to work together and problem-solve together. The core of the team are our 9 Public Service Assistants, who’s esprit-de-corps allows them to accomplish anything they set their minds to, and contributes to a positive workplace for everyone at HSS. Whether it is finding solutions for users, working on student engagement, supporting Librarians, or seamlessly implementing equipment lending services, the team is united in their mission of providing excellent service and creating a welcoming and inclusive environments at HSS and Weir. An environment, which they successfully maintained through the HSS first floor renovation in 2016 and after, as users adapted to the new space. They are committed to ongoing learning both as individuals and as a group. For example they challenged each other to undertake and complete the Indigenous Canada MOOC, and they continually seek learning opportunities and share them with each other. As a team, HSS PSAs literally work from dawn until dark seven days a week to make library collections, services, and facilities friendly and accessible. The PSA team combines knowledge, professionalism, and caring for library users. When students don’t know what a microfilm is or how to use it for their research, when they have no idea how to start their English assignment, when their paper is due in 10 minutes and the printer just won’t print, the HSS PSAs are there to collaborate on solutions and ease academic and library anxiety with understanding and humour. They advocate on behalf of students to their supervisors, bringing concerns and suggesting improvements. The core team of PSAs knows their key role within the public service infrastructure, and they are such a strong team that they are able to expand to include Indigenous Interns, SLIS Collaborative Students, Weir Student Employees, Librarians, and Practicum students throughout the cycle of the academic year. While continuing to provide excellent service and engaging in successful student outreach, they are constantly training new colleagues, leading by example, and inviting student employees to contribute to student engagement projects. While service often begins with them, the PSAs know they are part of a wider service landscape: they collaborate with and refer to Subject Librarians, Access Services, Bib Services and ITS colleagues, ONECard, IST, Protective Services, and beyond. Equipment lending is a service that has been so well loved by students and the only way this could have occurred was because of the efforts and work behind the scenes of the PSA team. However, it was only seamless for the students - the countless hours and time the team put in to make it work has been well noted by their HSS colleagues. This team works hard to successfully make an above-and-beyond level of care and service feel easy and seamless for users, whose experience always remains their top priority. Being the first point of contact is a huge responsibility and the HSS team does so with grace and a smile. Amy Southgate, Bernard Offengenden, Carmen Loconte, Denise Irwin, Hanne Pearce, Jamie Spivak, Noelle Fraser, Shawna Manchakowsky, Ursula Pilmeier. Planning on sitting back with the latest issue of your favourite journal? Browzine’s simple bookshelf interface gives you the ability to view single articles and full issues of journals. Curious about what other journals are available in your area of interests? You can browse an incredible array of journals available through UAlberta libraries and open access publishers using Browzine. Do you eagerly await the release of the latest issues of your favourite titles? You can save your favs to your personal bookshelf and get alerts when new issues are published. Headed somewhere where there’s no internet access? You can save articles to your mobile device for offline viewing. Discover an article that complements your research? You can easily export the article’s reference data into the reference manager of your choice. 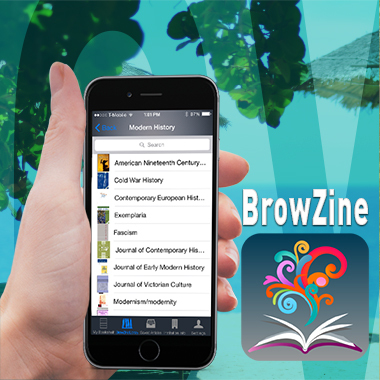 Click here to sign up for Browzine account. Not convinced of the benefits of Browzine? Check out this article on how Browzine can be a useful tool for researchers. I am nominating Jeff Papineau for a UAL Service Excellence Award for his extraordinary contribution to Bruce Peel Special Collections in all matters relating to service excellence. Jeff consistently demonstrates leadership and initiative in the unit, especially on public service matters that impact our researchers. A shining example of Jeff’s demonstrated excellent service to library patrons is his recent handling of a researcher visit that resulted in a cash donation to the Peel library. Gary Kurutz, retired Director of the Special Collections Branch of the California State Library in Sacramento, recently contacted Jeff to follow up on an earlier visit he made to the Peel library to consult Klondike materials for his forthcoming bibliography to be published by the Book Club of California. Gary asked if it would be possible to get the measurements of a title page and scan of a rare dust jacket for his bibliography. Jeff immediately obliged but he also showed great initiative by informing Gary of some recent acquisitions from the library’s uncatalogued backlog that Gary had never seen or heard of before. “Dear Robert, Enclosed is a donation in honor of the extraordinary service of Jeff Papineau of your staff. Jeff has always answered my requests with utmost professionalism and efficiency. He has made my research on writing a descriptive bibliography on the Klondike and Alaska gold rushes so much easier. In undertaking this project, I have now visited twenty-six research libraries and archives, and without doubt, Jeff has exceeded in service all the other institutions in responsiveness. The Peel Special Collections Library is most fortunate to have him” (Gary F. Kurutz, letter dated 10 December 2017). As a guest curator of Bruce Peel Special Collections, I wish to express my heartfelt appreciation for the outstanding support service that I received and continue to receive from Jeff Papineau as I prepare for an exhibition scheduled to be held in 2021. I am impressed by his professionalism and appreciate that he always provides service promptly and with a big smile. He often goes beyond his call of duty to accommodate special service requests from me, the donors, and the Chinese community such as locating more recent and uncatalogued archival materials on short notice. Sometimes he will take the initiative to make suggestions so that services can be delivered to us more efficiently. I believe that he is a great asset to the Peel library and all its users (Helen Cheung, email dated 25 May 2018). The impact of Jeff’s contribution to Helen’s exhibition work is remarkable. Jeff cares deeply about his public service work and he takes great pride in his role as an ambassador of the Peel library. The monograph acquisitions team, comprised of Sarah Chomyc, Kaitlyn Hill, and Carol Rodgers under the motivating leadership of Kathy Urban, works tirelessly to fill book, video, and other orders submitted by UofA students, faculty, and staff. Whether it is purchasing an ebook from one of our primary vendors, or buying one of a host of other unique and sometimes obscure items (robots, board games, a polar bear skull! ), the team members are committed to providing excellent customer service. They ensure orders are placed quickly and efficiently. When items are needed in a rush for use in class, they find means of expediting delivery to ensure the curriculum resources arrive in time. They always present a professional and tactful point of view, and follow up with patrons to ensure all questions are answered. They identify and set up relationships with new vendors for the purchase of non-English material. They exhibit persistence, and ensure all avenues are exhausted in the hunt for items that are sometimes very difficult to locate. In just one example, team member Carol went to great lengths to identify sources for authentic items for the completion of First Nations kits for the Coutts Education Library. Team members Kaitlyn and Sarah presented on their ordering work at the Staff Support Showcase last fall. In addition to purchasing materials for the libraries, however, they manage other responsibilities as well. They ensure print serials are checked into the catalogue in a timely manner, review donated materials to identify new items for the collection, and contribute to a wide range of collections project. As a cohesive team, they work well together to balance priorities to ensure that our users’ needs are met. One need only read the emails of thanks (eg. “Wow! You guys are amazing! I can't tell you how helpful this is and how grateful I am!! Please keep up the great work you are doing!” and “Wow! Our library is THE BEST! Thank you so much!”) or the tweets from happy library users (pic.twitter.com/2f1wYrC3AH) to know that this team provides a significant service to the university community that is widely appreciated. It is our honour to nominate Peggy Morgan for the 2018 UAL Service Excellence Award. Peggy, in her role as Application Specialist within the ITS ILS support team, provides exemplary service both on behalf of the University of Alberta Libraries and within the larger NEOS consortium. When tickets arrive in the helpdesk and are assigned to Peggy, she truly owns that problem, shepherding it from beginning to end, diving deep into the issue and often uncovering issues that might not have been apparent by solving the symptom rather than the root cause. Peggy is always concerned with providing outstanding customer service, and her focus at all times is on tweaking the system to meet and deliver that service need. Peggy’s special talent is bringing together system knowledge, library policy and end user service needs. She pulls it all together like few others can. Peggy always takes initiative in delivering top quality service through her courtesy, conscientiousness, timeliness, and respect for others, and her ability to actively anticipate and meet service expectations and needs. Peggy is an excellent teammate providing unwavering commitment and support to fellow ILS team members. Peggy is calm under pressure, patient, measured, and non-judgmental, and approaches every problem with her lovely sense of humour and wit. She is consistently enthusiastic about her work! Every time a head-scratching question arrives on Peggy’s desk, she approaches it with delight and gusto. She truly enjoys the ‘thrill of the puzzle’. In the current academic year Peggy has resolved a staggering number (500) of helpdesk tickets which is impressive in and of itself, but even more so considering the complex issues and questions that land in her inbox. Peggy is the solver of impossible problems and the one person we all go to when something in Symphony has gone a little sideways. Peggy has also provided leadership with the larger BLUEcloud Analytics project this past year, diving deep into the functionality and configuration of this new service and optimizing functionality to insure it will provide the information and data required to deliver high level service amongst the various NEOS Libraries. BLUEcloud Analytics will be a high impact game changer in our ability to make evidence-based decisions moving forward, and Peggy will have played a large part in the success of this project. Peggy is a master at finding efficiencies within the Workflows environment. An example from the last year - she figured out how to change the alternate circulation rule for recalled books so that the notices borrowers receive would always happen consistently and still ensure 2 full weeks of borrowing privileges. Little details like this make a big difference in the type of high level service we all strive to provide. It is my pleasure to nominate the Depository & Fulfillment Team for the UAL Service Excellence Award. This team has been crucial to the success of the BARD move to RCRF that took place from January 2018 to April 2018. The team demonstrated excellent service by maintaining access to the collections throughout the entire move, with little to no service disruption for UAL users, NEOS libraries, and external libraries. Logistically, having an active collection that is moving from one building to another across the city, is extremely daunting. An example is the sending of a book out to a user from BARD, then the tray is moved to RCRF, and the book is returned at BARD, which required planning and teamwork to ensure items ended up where they belonged. The team came together by bringing forward solutions to various situations that created barriers to our success. Servicing two facilities and materials in transit was one challenge, but it was further complicated by the limitation on access to the depository for purposes of retrieval, returns and move preparation, which was restricted to the hours of 8am to 12pm. Adjustments to workflow and schedules was necessary to keep everything moving. Many staff members showed leadership by volunteering to work adjusted hours to either supervise the move by working late or create additional access time to the depositories by coming in early. Others took on supervisory duties, worked on projects that required organizational and problem solving skills, and demonstrated further flexibility by splitting their days between facilities. This team truly rolled with the punches and stepped up to the plate where needed to ensure that the collection would be fully accessible, and all items could be found for user requests. Of course, the move started in January, but a lot of preparatory work had to be completed prior to the start of the move. This team carried out numerous projects prior to the move to ensure that the collection would be able to move in the best shape possible. These projects included the relabeling of trays to ensure a consist approach to tray numbers to help identify incorrectly scanned trays, cleaning up data in our systems by checking lists upon lists, and identifying and correcting errors in the collections. The dedication, flexibility, and stamina demonstrated by the team to get us ready for the move, and then see us through, has been incredible. Vaughn Munro, Dmitry Azarov, Jamie Rattai, Linda Wiersma, Bernie Judge, Jason Cameron, Trevor Cunningham, Michael Orsini, and Anuar Caldera. 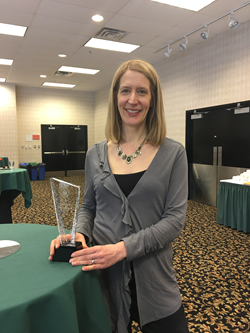 We are pleased to nominate Kim Frail, Public Services Librarian at the HT Coutts Library, for the UAL Service Excellence Award. As you will see, her system wide work is significant and she most certainly excels in all criteria for this award. Kim’s recent term as Chair of the UAL Teaching and Learning Committee is an exemplar of her commitment to service excellence and leadership. Over the years that she has chaired this group, and as the Subject Librarian for CTL, Kim has developed a series of unique and well-attended workshops with CTL-seconded professor Dr. Carla Peck for librarians to strengthen and deepen our teaching abilities. Kim’s leadership in and attention to supporting librarians to be strong instructors has resulted in the most rigorous attention to teaching development at the UAL in at least a decade and with tangible impact on teaching for all who have attended these high quality workshops. This aligns perfectly with the UAL Strategic Priority related the Teaching Library and shows a scope of accomplishment and relationship building within UAL and other campus units. Kim has taken a lead in this strategy being rationalized, developed and articulated for the UAL as a whole. It is thanks to many of her efforts and strong vision that UAL is moving forward as a Teaching Library. She is able to also communicate this perspective to others and does so enthusiastically and on an ongoing basis. Kim consistently shows initiative and innovation and the most recent and impactful example of this is her tireless effort to champion the inclusion of the Library Resources Block in eClass. Kim pioneered use of the eClass Library Block starting in 2012, winning a TIGER grant to work with an instructional designer to design the block. Kim collaborated with faculty and colleagues to assess uptake and use by students, providing statistics and laying the groundwork to back PSC’s initial advocacy with CTL to get the block hard-coded into eClass. Kim has maintained relationships with CTL and ITS in order to introduce updates to the block when the opportunity presented itself, and has advocated with effective persistence for the block to become present by default in all courses for 2018-2019 and beyond! Thanks to Kim’s efforts, and solutions-focussed perspective, library services are present for all students in the digital learning environment. You cannot get much more impactful than that! Her commitment to service is evident in the relationships she has developed in her Subject area, Elementary Education, where Department Chair Maryanne Doherty describes Kim as “a very positive asset to our Department in that she makes outstanding contributions” and that Kim’s “professionalism and ability to provide outstanding advice” is essential. 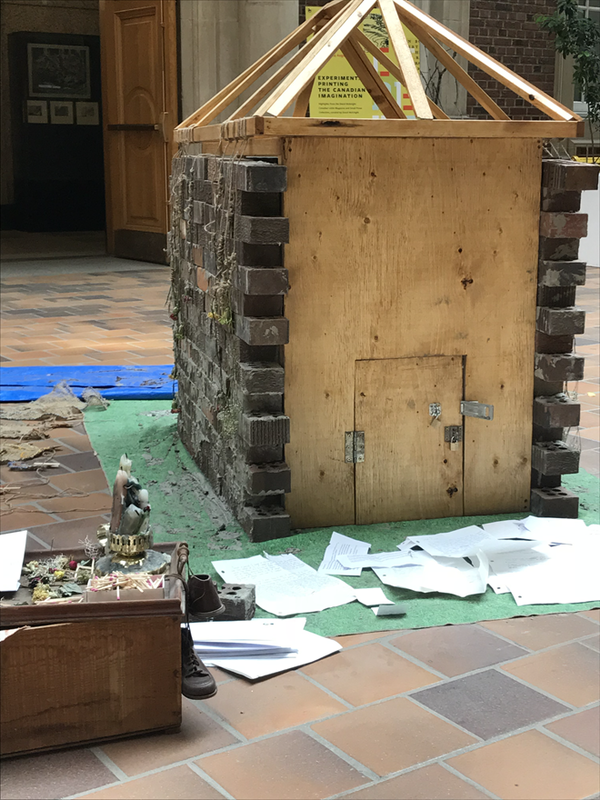 The libraries hosted a fantastic exhibition this spring in the Rutherford Galleria from April 14 to May 14, 2018. 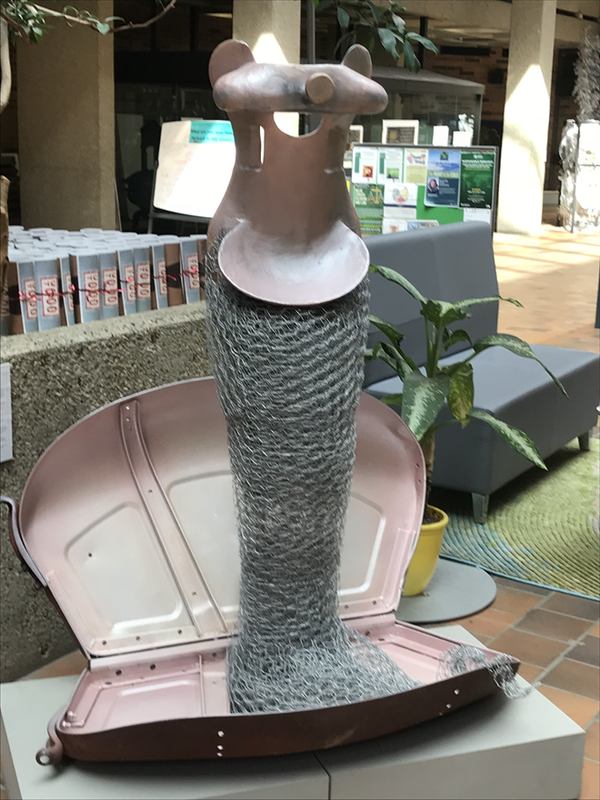 Check out this guest post from Royden Mills, UAlberta Sculpture Instrutor. This Exhibition offered energy from the momentum of studio artists who either were studying or have studied in direct connection to the Faculty of Arts and especially the Department of Art and Design at the University of Alberta. 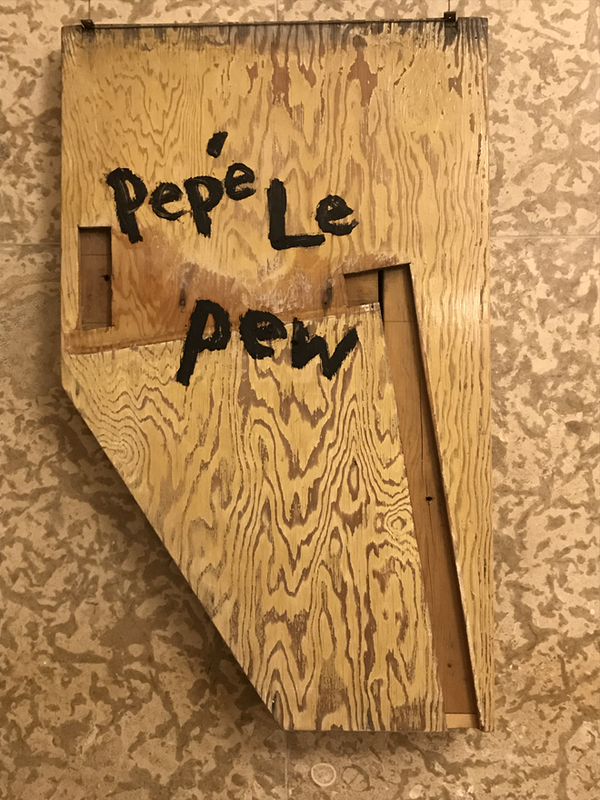 First Nations artists from Portage College in Lac La Biche presented an important collaborative Installation for this exhibition as invited guests. The spectrum of contributing artists included First-year Fundamental students with a cross section of Undergraduate students, a few Graduate students and former students who already had terrific, professional careers. This exhibition ran for a month and was really a wonderful opportunity; and we were grateful to the Rutherford Library staff, especially Michael May, who started the exhibitions years ago. We gratefully acknowledged stellar support from Sarah Polkinghorne who enthusiastically supported it and K-Lee Fraser who carried the energy wonderfully this year. 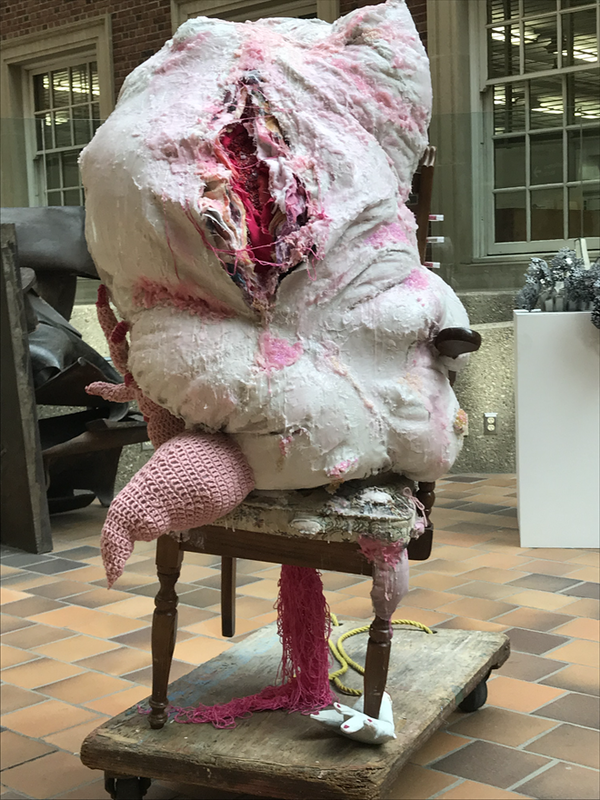 The Printmaking and Sculpture Divisions at the U of A made the show a part of the course curriculum and the undergraduate student work done by them was completed for this exhibition in less than the thirteen weeks of course time this term. The energy they dedicated spoke to a passion they had for efficiently using their studio practice and reached out in an effort to inspire others. These artists were all trying to make lives as studio professionals. Change Climate: The exhibition was titled in a way about the climate that these students wanted to address which included a range of serious issues that affected the climate of our existence. The changing weather patterns were obviously a very big and significant concern in our era, the anxieties that we felt over human influence over temperature change, the hopes and fears we felt around the socio-political climate of our era are also very much in the forefront of the minds of some of these artists too. In some cases the work spoke directly and obviously with full force on trying to provoke change or reaction, but in other cases there was expressed equivocation over feelings to do with human wilfulness and engagement with nature. There was no question that we had to do something about SO many things in our era and these were the people who carried the responsibility of trying to inspire us by using their Fine Art studio practice. They hoped we would consider things that we may have overlooked about being alive. Perhaps it was the role of artists to present alternatives to orthodoxy in our world through the very way they lived. Our students studied the traditions of Fine Arts proudly; they all were taught how to draw accurately, they were taught how to sculpt accurately, and they studied art history and contemporary visual culture; and they were faced with trying to sort out how they must generate sustainable lives as professional artists. The Art and Design Department has proven remarkably successful at launching people into pertinent careers by helping to build individuals who are agile enough to deal with many types of traditional and contemporary media. The students were challenged to take on the same uncommon work ethic that professionals of any discipline require. 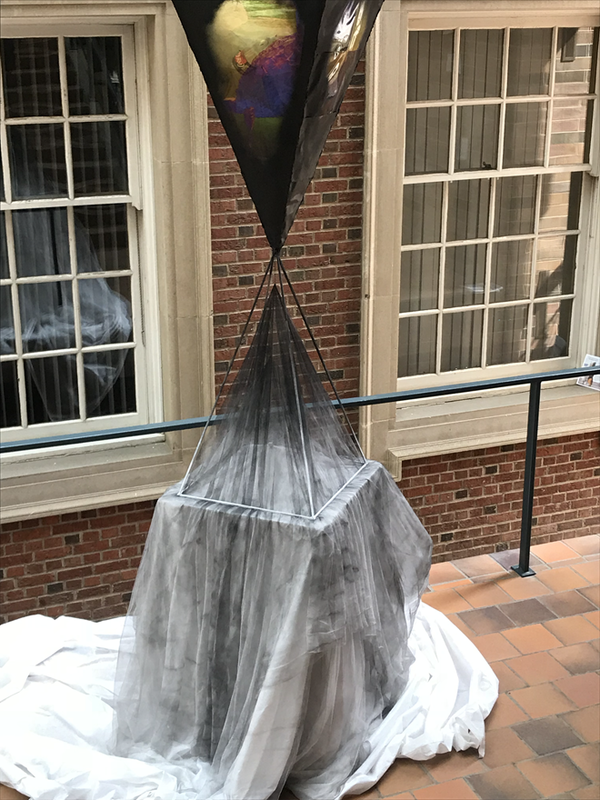 You saw work here by a spectrum of artists, junior through accomplished artists seeking not merely to match the décor or be background music to the daily life of this University space. They sought more. They respected the intelligence of the audience and believed that, generally speaking, all people enjoyed arriving at doing something that at first they may not have considered possible of themselves. That kind of satisfaction over applying one’s self and challenging one’s self was a sign of respect offered by these artists to the audience. In the end, the work validated both artist and audience member and in that way art really can save lives, one validation at a time. We hope you found something that stirred something in you!